LITTLE ITALY — For Chicago's Italian Catholics, Fridays during Lent mean one thing: Pepper and egg sandwiches. "I really think it's tied to Chicago," said Kathy Catrambone, executive director of the University Village Association. "It's like the Italian beef." It's a decidedly simple, and decidedly Chicagoan, concoction. 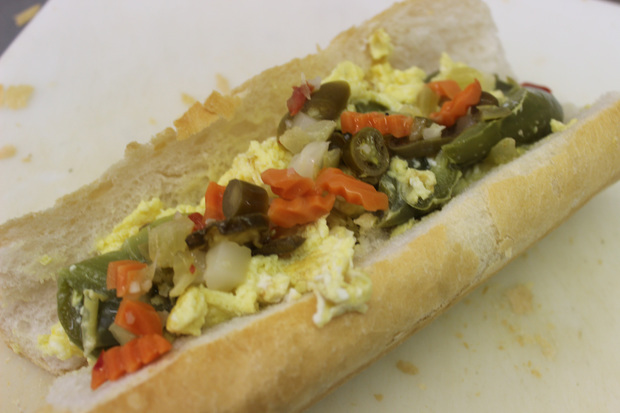 The classic version features eggs scrambled and mixed with bell peppers served on French bread. The sandwich was created by immigrants who came to Chicago from Italy in the late 19th century and early 20th century, though exactly who paired eggs and peppers together first is unclear. The sandwich has long been a centerpiece for Friday meals among Chicago's Italian Catholics, who until 1965, were required to not eat meat on Fridays. After 1965, that requirement only covered Fridays during Lent. Initially made in batches in home kitchens, today the sandwich is served in delis and restaurants owned by Italian-American families across the city. "I was the first to sell it," claimed Michael Fiore, who since 1970 has run Fiore's Delicatessen on the corner of Erie and Oakley in West Town. "Our sandwiches are special in the way we spice the peppers and roast them." But for some Chicago Catholics, the sandwich remains a year-round treat. "We have them for lunch all the time, all year long," said Nacho Bautista, a Catholic and owner of Gio's Cafe and Deli in Bridgeport, which serves the sandwich in a classic form and "Sicilian" with diced potatoes inside. Regardless of who created it, it's become a comfort food for many Chicago Catholics. "I’ve been eating them my whole life," Catrambone said. "It's the best thing about Lent. You get to eat pepper and egg sandwiches."